The need for hydropower looms large in political and economic discourse in Nepal—especially as Nepal emerges from the 2013 Constituent Assembly elections, the latest stage in a complex process of political and democratic transition. The promise of the hydropower future ensures the coherence of the state and vice versa—the ‘hydropower nation’ and the citizens required for that project are being co-produced. 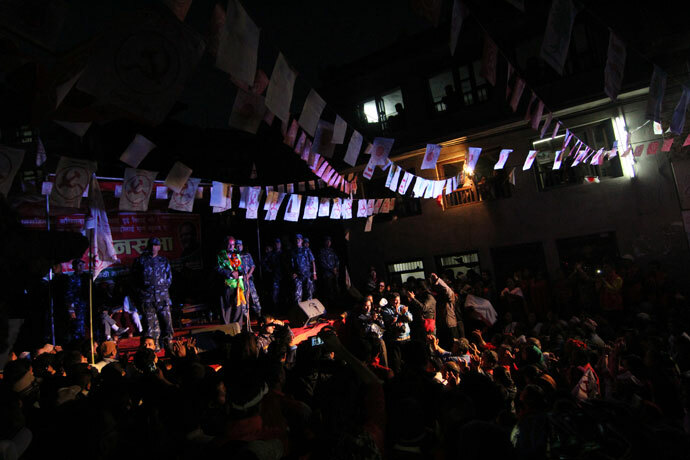 In this photo, Maoist-UCPN leader Prachanda gives his final campaign speech in Kirtipur the night before the November 19th elections—making commitments to bring hydropower development and electricity infrastructure to Kathmandu residents now experiencing blackouts that extend up to sixteen hours a day. Halfway through this speech, the lights went out. At the time this photo was taken, the Trishuli 3A project was stalled due to controversy on both the national and local scale. Firstly, the Chinese contractor CGGC was engaged in a political and legal battle with the government surrounding the scale and timeline of the project (CGGC wanted an upgrade to a 90 MW permit, based on unrealistic flow assumptions) that reached all the way to the Prime Minister. Secondly, locals in the ‘project-affected area’ had protested against the project, citing broken development promises, inadequate compensation, limited local hiring, and damages incurred from a series of landslides triggered by blasting of the headrace tunnel. Unfortunately, due to the governance structure of this particular project, the contractor has been assigned all responsibility for project delivery and project outcomes; there is very limited oversight. Thus CGGC has been able to benefit from crisis politics, brinksmanship, and systematic corruption to further its own aims (achieved through contractor’s ‘commission agents’) while the social and environmental impact assessment has proven meaningless. The Trishuli 3A Project was the first hydropower project I encountered in Nepal during September of 2012, and it remains one of the worst examples of social and environmental governance. Archale, Nuwakot District. September 2013. Hydropower development brings a new landscape of risk and opportunity to watersheds, but one already shaped by longstanding inequalities. Abstract ideas of ‘affectedness’ and ‘project-affected persons’ are in fact a diverse array of lives shaped by longstanding patterns of inequality and social exclusion. Consequently, the rights and needs of Dalit communities are imperfectly recognized and often politically overlooked within the process of hydropower development. 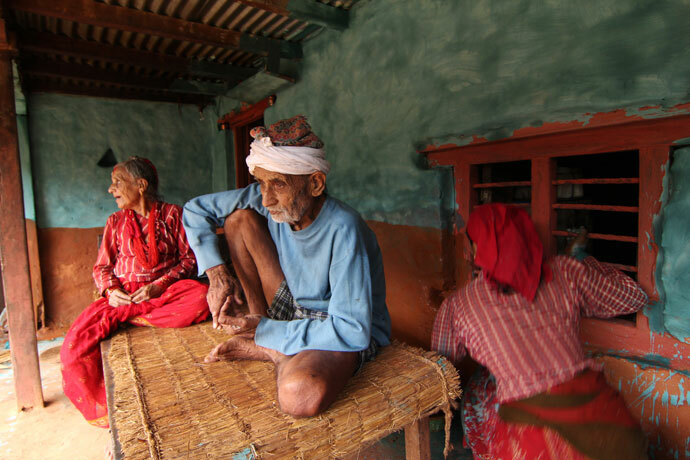 Despite the formal rejection of the caste system in Nepal, durable social prejudices and economic structural inequities limit the political voice and economic mobility of Dalit and other low-caste and marginalized people. 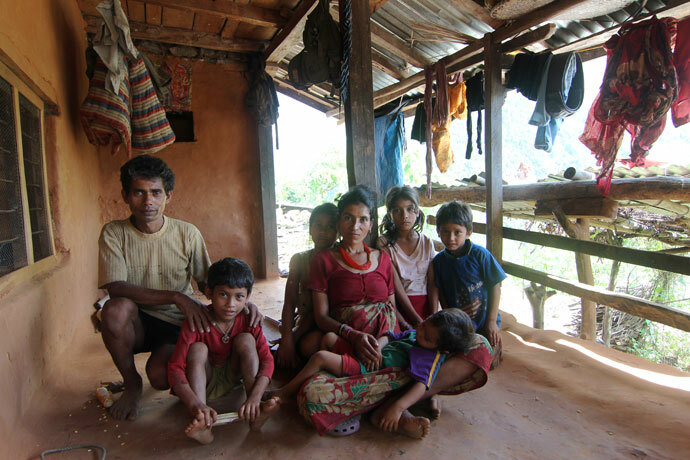 This Dalit family lives directly above the intake tunnel for the Trishuli 3B Hydropower Project, soon to be built. They expect that their small plot of land will be acquired by the project and (unlike most Dalits who do not hold title to their land) and hope to receive fair compensation that will allow them greater mobility. The father of this family has been working inside the tunnel of the Trishuli 3A project further upstream, which he says is very dangerous. But despite low wages and safety concerns, this is undoubtedly the best work he can get in the area—most Dalit laborers work in the fields for high-caste landlords who pay in food and very limited wages. Most high-castes in this area do not want to work for the project, instead choosing more lucrative jobs in the Gulf States. But as a Dalit without social connections, this man cannot find good work abroad. So he and others with limited options work in the tunnel, while their needs are simultaneously crowded out or silenced in more processes of formal stakeholder engagement. Thus some have better access to the hydropower future than others. 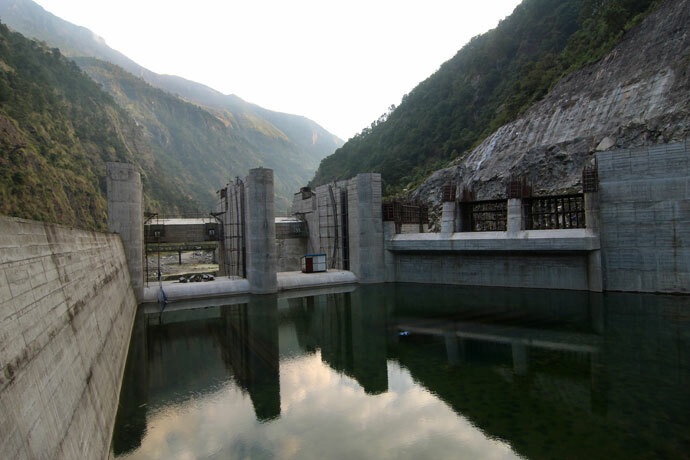 Completed in 2003, the Chilime Hydropower Project is often considered an example of ‘best practices’ of hydropower development, and is sometimes even referred to as an ‘indigenous project’ due to the role of Nepali engineering and Nepali capital. 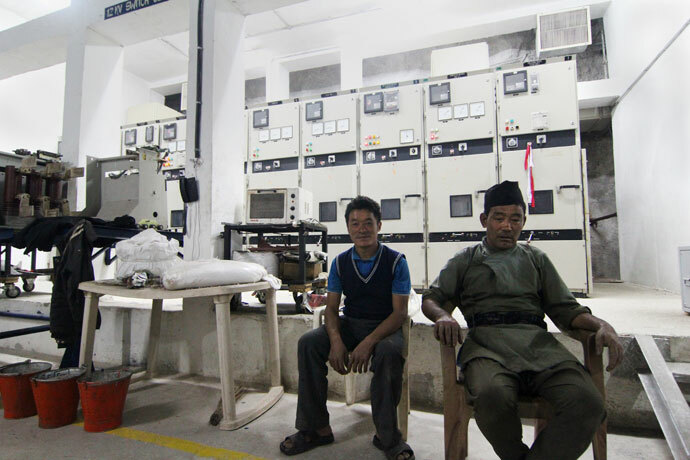 In 2010, the Chilime Hydropower Company Ltd. completed an IPO on the Nepal Stock Exchange (NEPSE) and broke new ground by offering 10% of these publicly traded shares to local ‘project-affected people’ living in Rasuwa District. By providing a direct equity stake to local people, the Chilime Model has proven to be a pragmatic and effective model of benefit sharing—improving upon other models that are prone to corruption, elite capture, and politicization. Local people have benefited significantly as the value of Chilime’s stock continues to rise, and the company is now pursuing several other projects in the region with local support. 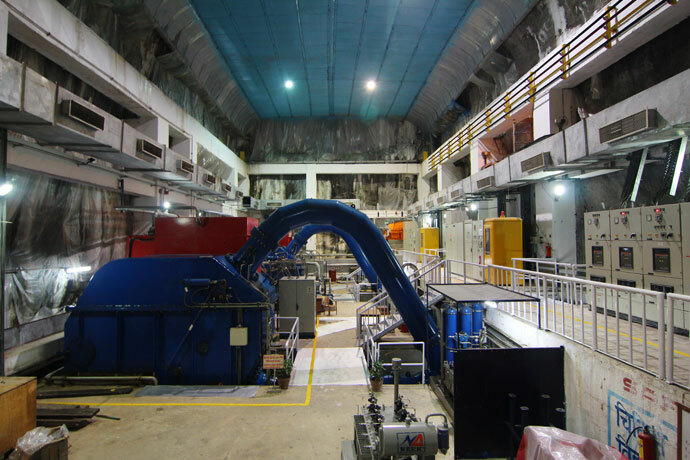 This photo of the nerve center of a well-run medium-scale hydropower project is thus a unique kind of success story—can this be replicated? Shanti Bajaar, Nuwakot. October 2013. 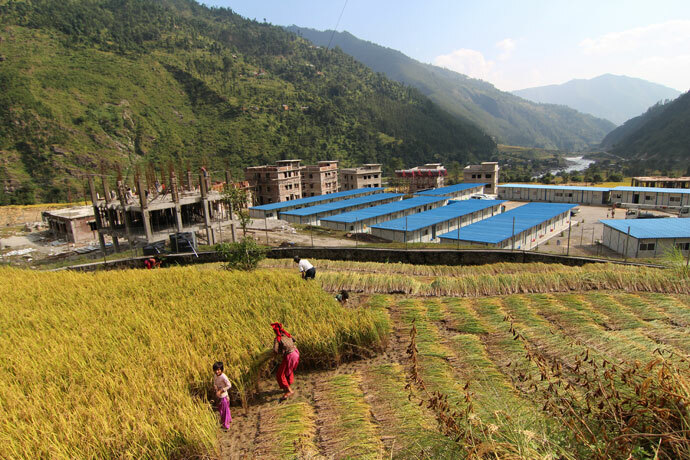 Built in the middle of rice fields along the floodplain, the project headquarters is an assemblage of different activities and institutions – an arrangement reflecting the larger pattern of hydropower development in Nepal. 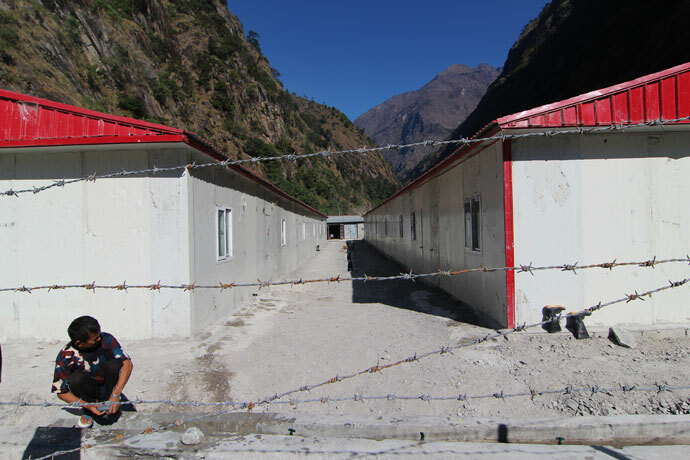 At the center of the complex are the field offices for the China Gezhouba Group Company (CGGC), the contractor for the Trishuli 3A Project, surrounded by temporary housing for some eighty Chinese engineers and twenty Nepali employees (there is another labor camp further upriver at the dam site that houses the majority of informal laborers). The CGGC camp, in turn, is encircled by the half-finished shells of seven buildings that will serve as the field offices for the Nepal Electricity Authority (NEA) during the construction and commercial operation of the Trishuli 3B Hydropower Project and the Trishuli 3B Transmission Substation. Immediately outside the complex sits a station for the Nepal Armed Police Force (APF) who are tasked with securing the project area. These men are migrants from other parts of Nepal who have arrived at the hydropower frontier in the hopes of finding work. 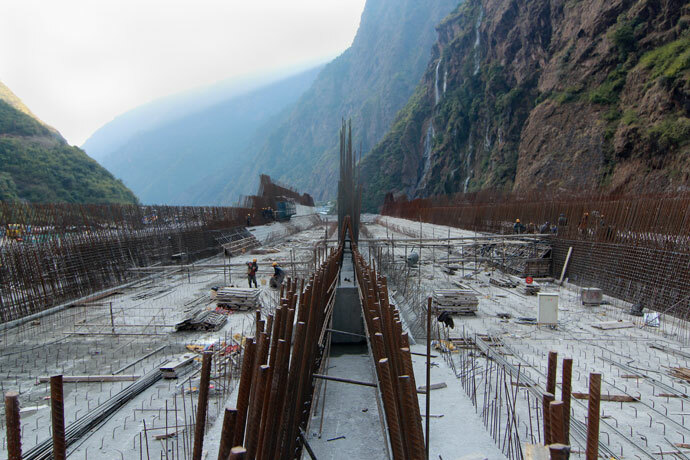 This photo was taken just outside the field offices of SinoHydro, the Chinese contractor completing the civil engineering works for the Upper Tamakoshi Hydropower Project. These men are holding their hiring paperwork in their hands, and wearing their newly issued safety gear. 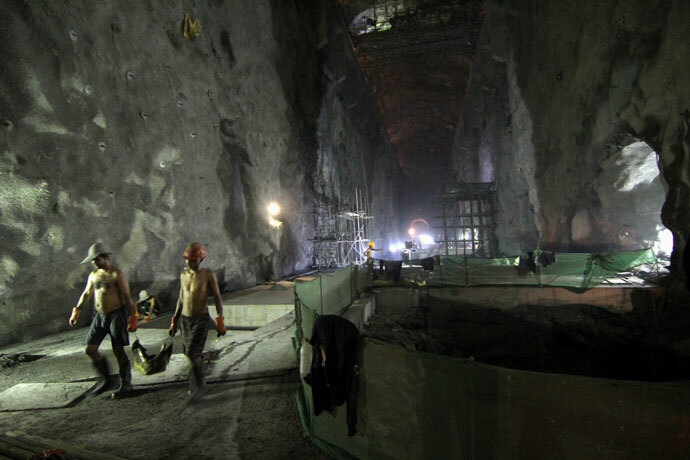 Work at the project site is intensive and often hazardous, especially within the tunnel system – though the UTKHP does have a good safety track record, which is monitored by a Norwegian engineering consultancy NorConsult. Employees generally work in 11-hour shifts, rotating to ensure 24-hour construction. For this project (perhaps due to government and third party oversight) the pay is considered good for the area, and hundreds of people have come into the area from outside – some are daily or task-specific wage labor, and some work on monthly contracts. Nag Dahal, Dolakha. December 2013. Ten years ago, a flood warning siren system was installed in the Tamakoshi River valley to warn inhabitants in the case of a ‘glacial lake outburst flood’ (GLOF) from Tsho Rolpa, located some 60 kilometers upstream. Tsho Rolpa is a massive glacial lake that has been expanding as climate change causes glacial ablation in the Upper Rolwaling, and was considered very high-risk until extensive engineering efforts succeeded in lowering the water level. Ironically, some 12 kilometers of the Tamaokoshi valley will soon be flooded by the Tamakoshi III project. 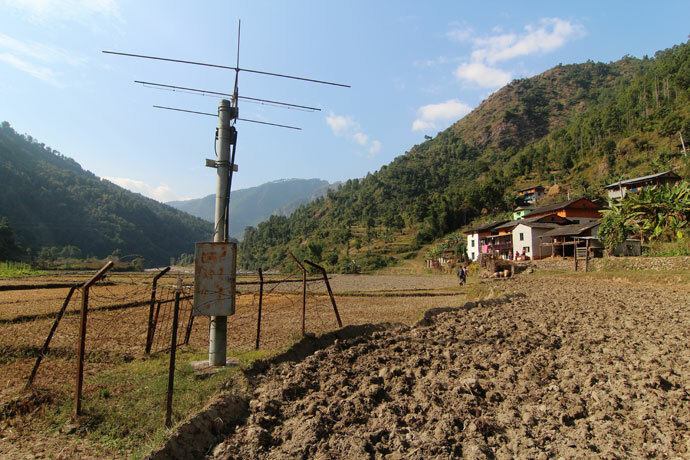 Yet the siren system still stands in the fields of Nag Dahal, a village that will be entirely underwater and relocated, as a testament to a different kind of risk calculation. 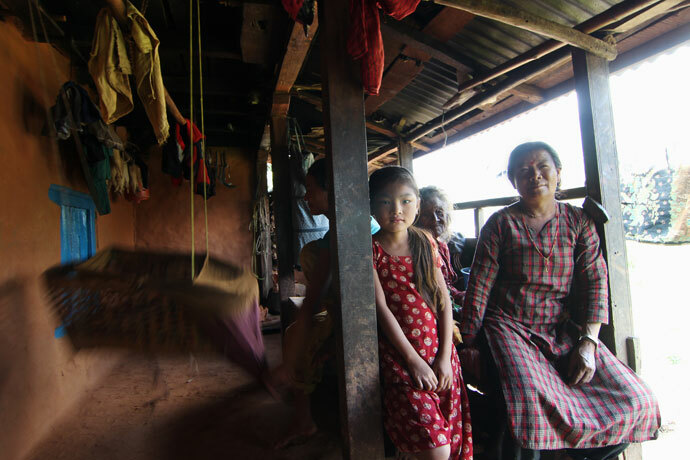 Gendered social exclusion is a major issue across Nepal – which reproduces itself in terms of hydropower development, driving problematic trends within the process of stakeholder engagement. Women often lack information about hydropower projects, and women are always under-represented at project-related meetings – they are told not to go, are unable to attend due to domestic or subsistence workloads, or do not feel comfortable at meetings. Ethnic, caste, and class divisions and exclusions often worsen the situation. Further, massive trends of outmigration have increased the pressures that keep women at home, leading to widely recognized patterns of the ‘feminization of labor’ and the intensification of household work, in the absence of male family members. Social mitigation and stakeholder engagement needs to make a greater effort to engage women in the process, to account for their views and promote their voice in decision making in a substantive way – yet this is rarely the case. 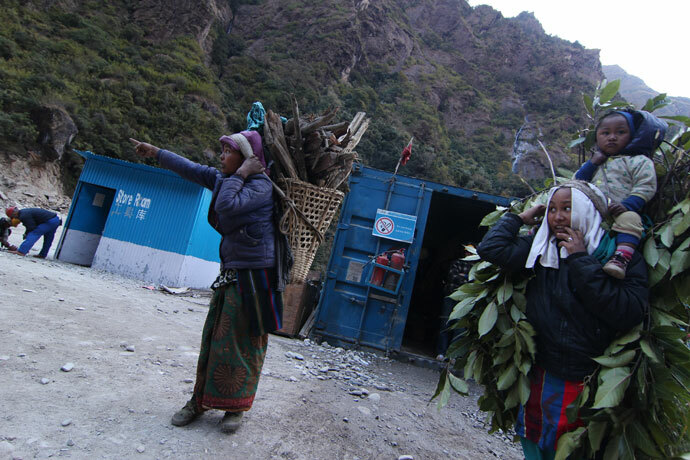 At the time of this photograph, these women knew very little about the pending hydropower project, despite the fact that the tunnel will go directly beneath their home. 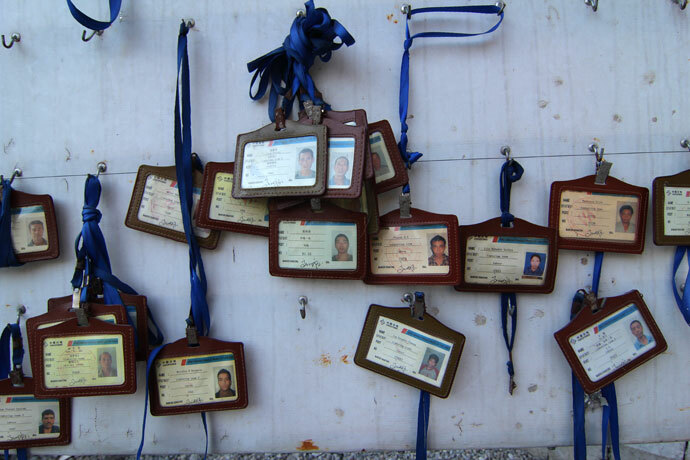 These identity cards hang outside the main powerhouse access tunnel of the Upper Tamakoshi Project, where there are roughly 80 people working in the main cavern at any point in time – blasting, running excavation machinery, constructing the armature of the powerhouse, pouring concrete forms, and laying cable and conduit for the electrical infrastructure. 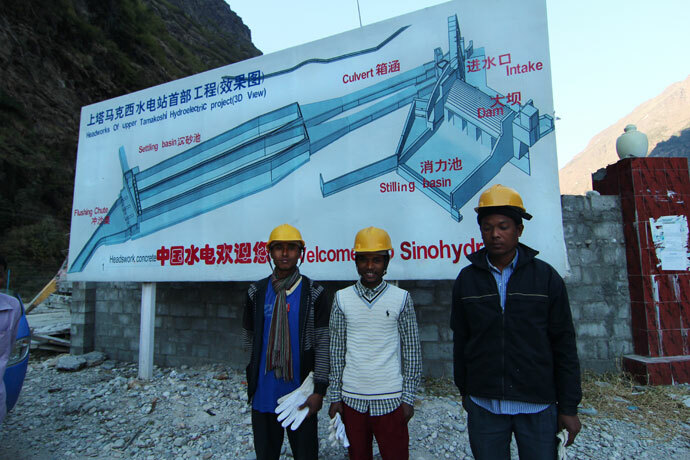 Project contractor SinoHydro has over 1600 employees working in different facets of construction—the majority of these workers are Nepali laborers, both skilled and unskilled, but there are over 300 Chinese workers and engineers as well. Construction works are overseen by an army of engineers and consultants hailing from Nepal, China, India, Norway, Germany, and the United Kingdom. Though the Upper Tamakoshi Project has an excellent safety record considering its scale, tunnel work raises particular risks and concerns about environmental health - several other projects in Nepal have had serious accidents in recent years. The UTKHP also pays a decent working wage, while several smaller projects do not. Yet due to widespread unemployment and the parallel risks of labor migration, local people across Nepal value the opportunity for any kind of project work. Over fifty years ago, this man worked for three rupees per day as an unskilled laborer during the construction of the 22 MW Trishuli Power Station, which was the largest hydropower project in Nepal when it was completed in 1968. The first Trishuli project was a spectacle at that time, bringing successive waves of foreigners and thousands of laborers from all over Nepal and South Asia, which led to significant changes in local land use and the deforestation of large parts of the watershed to support the construction effort. Some things have changed, and some have not. 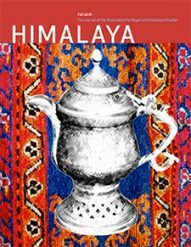 In the 1960s laborers dug canals and laid pipes to create hydraulic head; now men and machines are drilling massive tunnels into the Himalaya. The village of Archale is currently impacted by two large contemporary projects, as it is located directly above the main tunnel of the pending Trishuli 3B Project (37 MW) and just downstream from the controversial Trishuli 3A Project (60 MW). This man has lived in Archale for over eighty years. He has seen Italians, Germans, Indians, and Chinese come and go to build the hydropower future, and he has now been a ‘project affected person’ three times in his life. This man and the settlement where he lives are both within the 'inundated area' of the pending Tamakoshi III Hydropower Project, a 650 MW ‘export project’ that will evacuate nearly 100% of electricity generated to India. Such projects are controversial in the current historical moment considering Nepal’s own demand for power, and an electricity deficit often described as a crisis. Such export projects are currently in the political spotlight, after the visit of Indian PM Narendra Modi and the signing of a Power Trade Agreement between Nepal and India that will facilitate international investment to exploit Nepal’s hydropower resources for mutual gain. This project is being pursued by SN Power, a Norwegian contractor which previously completed the nearby Khimti Project (60 MW)—the first private sector hydropower project in Nepal, considered successful in terms of social and environmental mitigation. This mega-project is a ‘peaking reservoir’ project which will periodically submerge roughly 12 kilometers of river and an estimate 88 homes, requiring the relocation and resettlement of roughly 400 people. The requisite environmental impact assessments, formal public hearings, and informal compensation negotiations have all been conducted—‘directly affected people’ are largely prepared to move from their homes, while the rest of the ‘indirectly affected people’ are hopeful of economic development. In 2013 the project was stalled due to political instability and corruption, but recent talks with India have made the future of the South Asian grid much more real. Shanti Bajaar, Nuwakot. September 2013. Flanked by security forces and project planners, an elderly Tamang man watches a locally organized boycott of the official public hearing for the 37 MW Trishuli 3B Hydropower Project held in late September in Nuwakot. This hearing was particularly contentious due to local dissatisfaction with the preceding Trishuli 3A Project, where the Chinese contractor CGGC has not adequately responded to local concerns. Learning from past experience with the political processes of hydropower development, a local concern committee requested that a list of their formal demands be included in the public hearing. Since the Nepal Electricity Authority failed to include these demands, using re-prints of an outdated environmental impact assessment instead, a local boycott or bahiskaar was successfully organized. After lively debate between different ‘project-affected communities’ most of the over 300 people assembled walked out before the meeting formally commenced, and the program did not continue. Nonetheless, the media reported that the hearing was a success. 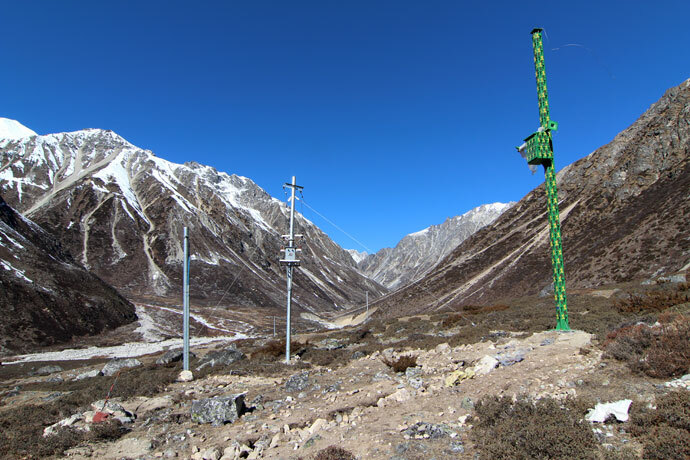 This photograph, taken directly at the border of the Tibet Autonomous Republic (China), shows powerlines coming from the Tibetan Plateau that have already been built in anticipation of future border development and transboundary connection. Currently the road ends in Lamabagar, but in the coming years three permitted hydropower projects along the Upper Tamakoshi River and Lapche Khola (representing roughly 430 MW in total) the road will bring the road all the way to the Tibetan border, creating a new overland route and trade corridor. Curiously, the last pole is painted in camouflage. This road leads along the Trishuli River to Mailung, a small Tamang village that now hosts three different hydropower projects: the Upper Trishuli (216 MW), the Trishuli 3A (60 MW), and the Mailung Khola (14 MW). 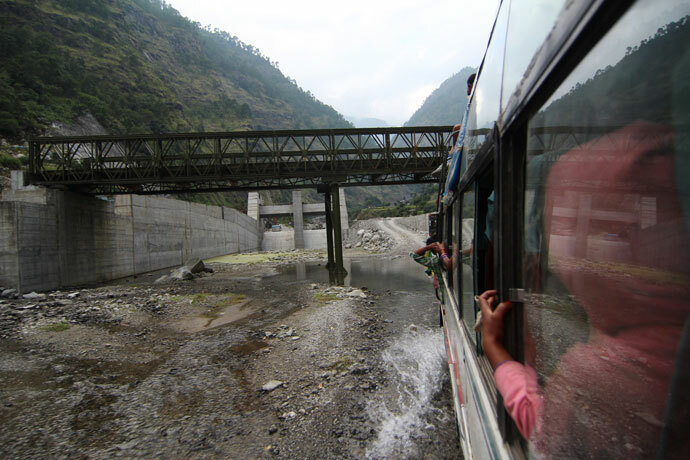 At the time of this photo, the road led directly through the headworks of the dam site for the Trishuli 3A Project, being built by Chinese contractor CGGC, which was halted for several months in 2013 due to political disagreements, cost overruns, and local protests following landslides triggered by tunnel blasting. Initially built for the smallest of the three projects, this road has been expanded significantly to facilitate project construction, resulting in boom towns and labor camps. Eventually, two more hydropower projects will bring this road to Syaphrubesi, where it will meet with the newly completed Keyrong Road, creating a major transit corridor along the Trishuli River linking Kathmandu to the Tibetan Plateau and China. 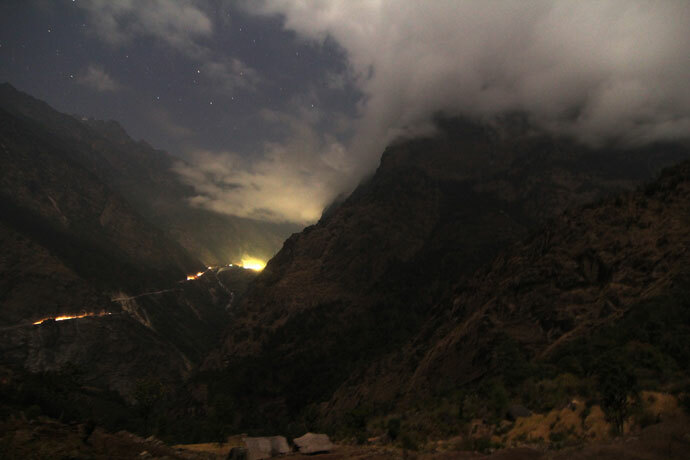 This photo shows the road to Lamabagar at night, a 68 kilometer track built for and by the Upper Tamakoshi Hydropower Project (456 MW), currently the largest project being built in Nepal. Trucks run throughout the night to resupply Lamabagar with construction materials and supplies to support over 2,000 laborers and residents. Just five years ago, Lamabagar was considered a very remote area, three days walk from the end of the existing road. Local people praise the convenience and connectivity that the road offers, but express concern about compensation, the tumult and dust of living in a construction zone, and the volumes of people who have arrived to start their own businesses in the area. Once this project is completed, the road will continue upriver to facilitate two other planned hydropower projects, eventually connecting overland to the Tibetan Autonomous Republic (China) through the remote border area of Lapche. Soaltee Crowne Plaza Hotel, Kathmandu. August 2013. As the production of Nepal’s hydropower future continues to intensify, more Nepalis are becoming ayojaanale prabhabit manchhe or ‘project-affected people.’ Focused on projects under construction in the upper watersheds of the Trishuli and Tamakoshi rivers, this photo essay evaluates overlapping and uneven patterns of social and spatial change that characterize the lived experience of hydropower development in Nepal. Massive political and financial efforts are being made to secure the hydropower future for the well-being of Nepal’s citizens; in the name of economic security, energy sovereignty, political stability, and social justice; and in response to a discourse of permanent and interpenetrating crises – as one person explained to me, “To keep an entire generation from growing up in the dark.” Using visual ethnographic methods, this photographic essay highlights the ways that remaking Nepal into an imagined ‘hydropower nation’ is creating new landscapes of risk and opportunity, complicating patterns of work and mobility that are already in flux due to ubiquitous patterns of outmigration and foreign employment. This essay seeks to provide an aperture into how differently placed and differently implicated ‘project-affected people’ grapple with Nepal’s hydropower future. Though Nepal does need hydropower development, it is important to recognize the ongoing dissonance between the massive financial and political mobilizations supporting hydropower projects and the continued conditions of scarcity and risk that characterize life in the ‘developing watershed.’ Nepal is an extremely unequal society, and the flows of international capital and political will that support hydropower development connect two very disparate worlds. 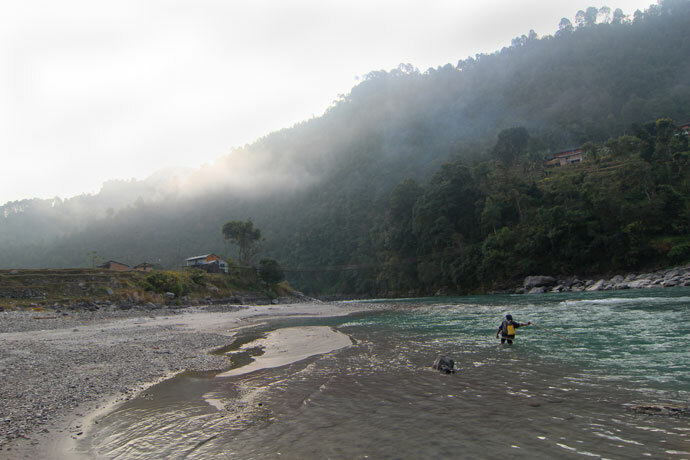 Nepal’s hydroscapes are therefore a place of considerable contrast; the making of the hydropower future is a site of confluence. As hydropower development expands across the physical and human geographies of Nepal, it generates divergent patterns of empowerment and disempowerment, connectedness and fragmentation, and continuity and discontinuity. As the hydroscape and its territories are created, so too the lives of diverse project-affected people are at once expanded and limited. One of the primary goals of this photo essay is to illustrate how hydropower development and labor migration are interrelated. They are connected by common economic urgencies and problems of social justice, interwoven across physical and cultural landscapes. Each hydropower project in Nepalis shaping and being shaped by specific localities as well as by concepts of belonging, citizenship, and ‘affectedness.’ These projects are more than infrastructural; they exemplify aspirations of individuals, communities, and the Nepali. As each project develops, opportunities and patterns for the deployment, exchange, and replacement of local and extra-local labor become increasingly intricate. Other projects follow, the road wends further upstream. Some people wish to go, others wish to stay. Flows of labor, capital, and imagination are coming and going, rushing into the watershed, churning and eddying for a while, then trickling or roaring away. The images in this photo essay aim to increase the visibility of social and economic issues that arise along the frontiers of hydropower development in Nepal. Directly, these photographs depict the inescapable materiality of hydropower development: the men, machines, concrete and labor involved in this effort as well as the local conditions of labor and mobility at a variety of project sites. But just outside the frame are millions of Nepalis who labor outside the country under harsh conditions. As these migrants try to overcome the structural inequities that placed them in India, the Gulf States, Malaysia, they also remain connected to ‘project-affected areas’ and the concerns of the hydropower future. 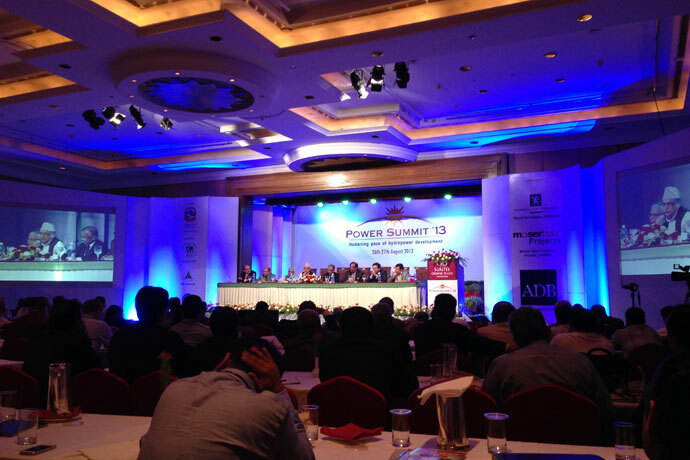 Given these dynamics, we might ask: what kind of hydropower future is Nepal developing, and for whom? The making of the hydropower nation has the capacity to serve citizens of Nepal by supporting economic development in ways that can reducesocioeconomic inequality. Or it can reproduce and exaggerate existing structural inequalities. Because it will likely do both, it is important to watch closely – to engage in a politics of seeing.